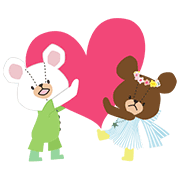 Heartwarming and sweet stickers featuring a day in the life of Jackie, the mischievous little bear. Jackie is looking better than ever with a brand-new poppy style thatʹs sure to delight fans of all ages. This set also features Chackieʹs big debut at LINE! The Bear’s School is back for a third set of stickers, featuring Jackie with plenty of friendly messages to let others know how you feel.